Editor’s Note: There has been a lot of talk in the gold and silver community about what happens to the gold to silver ratio during a hyperinflation. See recent coverage, in chronological order, here first, then here, and and finally here, for what is turning out to be a treasure trove of information that readers can use to draw their own conclusions. Rather than write on a planned topic, I received at least 20 e-mails yesterday on the same subject so had to switch gears. The e-mails were all panicky because an analyst who works in the precious metals industry suggested that silver will not perform as gold will in the coming reset. I feel the need to address this because I believe it is faulty analysis and may have motivation behind it. I will not name the analyst but can be easily discerned. In an interview it was said that during the Weimar experience, gold performed extremely well but silver lagged. It is for this reason they suggested not to pay attention to the current out of whack silver to gold ratio north of 80-1 and it will not narrow. This is just wrong for so many reasons. First, the ratio of silver to gold worldwide at the time was roughly 15-1. Silver was priced at $1.385 per ounce while gold was at $20.67 per ounce in dollar terms. This 15-1 ratio was much closer to the ratio of silver versus gold in the Earth’s crust and extracted via mining. Silver actually exists at a ratio of slightly less than 10-1 versus gold, this is what I call “God’s ratio”. Back in 1923, most of the world held at this ratio, if it was true that gold vastly outperformed silver in reichmarks, this would mean the ratio of value for gold versus silver was moving higher. If this were to have occurred, there would have immediately been arbitrage where gold would have flooded in to Germany while it would have been emptied of all silver over the 15-1 ratio. Yes it would have been clunky and slower than in today’s world but it would have occurred nonetheless. 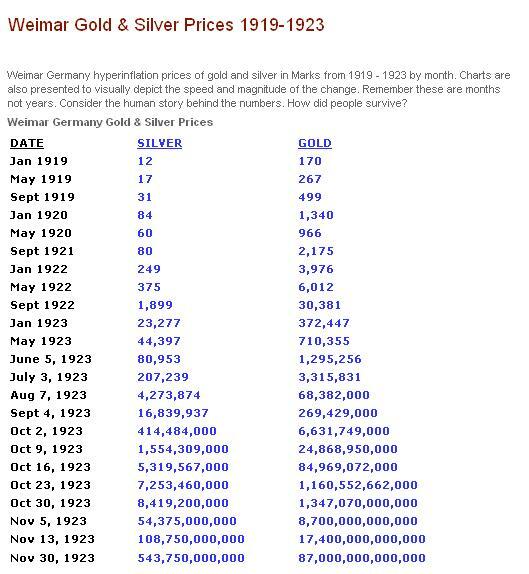 As a side note, the analyst claimed a 160-1 silver to gold ratio prior to the German hyperinflation and the same ratio afterwards which would mean silver and gold moved in lockstep. At that time with a 15-1 ratio worldwide, ALL silver would have been drained via arbitrage from Germany! To suggest this happened and silver that would have been undervalued versus gold and was not arbitraged out of Germany is simply false. Think of it this way, you could swap one gold ounce for 160 silver ounces in Germany, ship the silver out to America or elsewhere and then re swap for 10 times more gold than you started with …this most assuredly did not happen. This has been added since the article went out to subscribers. Looking past the current man made ratio of 80-1, there are no large stockpiles of silver held by central banks currently. It is reported that JP Morgan has amassed more than 600 million ounces and long been rumored that China may hold 2 billion ounces. Silver for the most part is used once it is mined. It is used for industrial, technology, armaments, solar, medicinal and many other uses …which year after year have been increasing. My point is this, silver is mostly used and little in the way of large stockpiles exist to be actually be dumped on to the market which has always been the fear in gold. As for this fear, real physical gold and silver have not hit the markets to cause prices to drop. The supply has been that of paper contracts where the real metal does not exist. The “supply” has been grossly diluted and distorted. To illustrate just how bad the paper scheme has gotten, so far in less than 6 months this year, COMEX has sent EFP contracts to London representing 1.6 billion silver ounces and 4,000 tons of gold. The world only produces less than 800 million ounces of silver and roughly 2,400 tons of gold (ex Chinese and Russian production) per year. At these rates of so called delivery, we are being led to believe London will deliver three times the amount of gold mined and 4 times the amount of silver mined this year. This is clearly fraudulent! As to this analyst scaring people away from silver and toward gold, I believe is extremely disingenuous. The fundamentals do not support the case at all, in fact they support being far more heavily weighted in silver rather than gold. Checking for possible other motivation I called their firm to query purchasing a specific coin. I asked their pricing on a MS63 $20 St. Gaudens which should be priced slightly under $1,400. The price quoted was $1,653. In this case, gold is better “for the dealer” but not the customer? Folks, as my partner Jim Sinclair says, “silver will be gold on steroids when this plays out” …and he is widely known as “Mr. Gold” but suggesting silver will massively outperform gold! Do not allow yourself to be fooled. Follow logic and the fundamentals only. The fact is, sovereign central banks and treasuries are widely on the precipice of collapse due to over indebtedness of the state and financial systems. They are the ones who “print” the money which you should consider as nothing more than IOU’s. If you are smart and do not want to accept and hold IOU’s from an insolvent issuer, you then turn to gold and silver which are purely asset money with no liability attached. With history as a guide, silver is extremely undervalued versus gold. In fact, the argument that silver is the cheapest asset on the planet is correct in my opinion.